Lesson Volunteers – participate in direct client services under the supervision of CKRH staff and instructors as Leaders or Side Walkers. Equine Care Volunteers – assist with care and feeding of the horse by volunteering in the barn as Wranglers, Hay Crew, or a Ground Work Assistant. Junior Volunteers: Junior volunteers are 12 to 16 years of age and work under the direct supervision of the equine manager or a volunteer mentor. They do not participate directly in lessons. Junior volunteers must be accompanied by a parent or another adult until they have demonstrated that their maturity and skills are at the level where a staff person determines an adult is no longer necessary. Junior volunteers must demonstrate the ability to act responsibly in the barn area, complete task, and follow barn rules and guidelines. Barn Help: Barn helpers keep our facility organized, clean, and safe. Duties will vary. Training will be on an individual basis. Haycrew: Haycrew is the team of volunteers who feed and care for our horses. Haycrew volunteers are year-round and are able to commit on a monthly basis, to a weekly designated time slot. Pamper Pals: Pamper pals work under the direction of the equine manager to obtain the highest standard of health and well being for our horse herd. Ground Work Assistants: Ground work assistants work under the direction of the equine trainer to improve the ground manners of our therapy horses and insure that each horse feels comfortable in lessons. The result of this training and conditioning is a more enjoyable and safe lesson environment for all horses, participants, and volunteers. 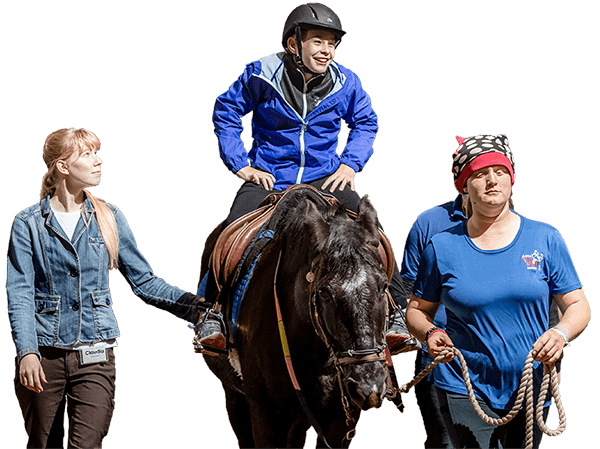 Mounted Training & Conditioning Assistants: Mounted training & conditioning assistants work under the direction of the equine trainer, training and exercising horses to keep them supple, physically fit, and more responsive to their riders. There are two categories of training and conditioning volunteers. The level is determined by ability, experience, and how long a volunteer has been with CKRH. Responsibilities include those listed below, as well as any of those listed under ‘ground work assistants.’ Horses used during training sessions must be appointed or approved by the equine manager or program director. Special Events Volunteers - includes CKRH equine special events like Summer Camp, High Hope Steeplechase, Paul Frazer Memorial Horse Show, Pony Club Rally, Special Olympics, etc. Special Event Volunteers includes CKRH equine special events like Summer Camp, horse shows, Pony Club Rally, Special Olympics, etc and serve in the capacity as a Leader, Sidewalker or Wrangler and must demonstrate appropriate skill set. Fundraising Events & Admin Volunteers – there are several fundraisers throughout the year that need the help from creative and outgoing volunteers that may not be horse savvy. We also need volunteers that can come out and help with answering the phones and doing some light office work; filing, copies, create marketing materials, data entry, etc. Fundraising events are annual fundraisers for CKRH. Each event has its own specific needs and time commitments for volunteers. CKRH new volunteer orientations or group training is not required. A volunteer application or liability release form must be on file at CKRH. Administration volunteers fulfill ongoing needs within the categories below. CKRH new volunteer orientations or group training is not required. A volunteer application or liability release form must be on file at CKRH. If you have additional talents and skills in addition to what is listed, please let us know! If you have other talents you would like to share with CKRH, please let us know!